(Jeff Solomon Photo) Miss Melanie and the Valley Rats perform at the Rusty Rail in Mifflinburg. A relatively new Centre County songstress has a big voice that sounds as if it’s been around for a long time. Hearing Melanie Morrison Zeigler sing, some listeners are reminded of three of her idols: Etta James, Ella Fitzgerald, and Aretha Franklin. 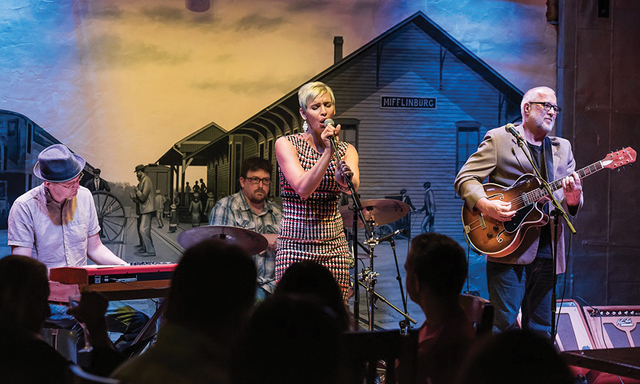 When “Miss Melanie” of the 7-year-old band, Miss Melanie and the Valley Rats, delivers the blues on stage or on one of four CDs, she can wail smoothly from mezzo soprano to high baritone. It stuns audiences. If you were to close your eyes at a stage performance, you’d never imagine a slim, 5-foot, 10-inch (until she puts on high heels) woman with short blonde hair, often previously washed of, she says, a “super-crazy” color. The first time I heard her was an accident. Arriving for a State Theatre committee meeting in the “Attic,” our gathering sat inches from a musical group wrapping up a rehearsal. It was so good, I was surprised we weren’t paying admission. Rather than being in a big city, she has landed here. “Miss Melanie,” who will turn 39 next month, has been a Centre Countian for 16 years, initially living on Valentine Hill Road in Bellefonte. Her family ensemble – “two adults, three children, two cats (one sadly has since died) and a bunny” – lives “right on the main street” in Millheim. Down the road, they may live somewhere else in the county. She grew up as Melanie Obusek in Pittsburgh’s West End, across the water from the former Three Rivers Stadium. Except for church and school choirs and a few special-occasion requests, singing was generally personal. “My mom always sang to me as a child. She had (and has) a beautiful voice,” Miss Melanie says. She might be singing an R&B favorite. “I always wanted to sing R&B. That was the music I gravitated to,” she says. “What I love” about such singers as Aretha Franklin and Chaka Kahn is their “authentic and natural” sound. Miss Melanie goes there with this “bluesy” (leader Mark Ross’s term) band. “I kind of feel the energy,” she says Eyes often closed, “you put yourself into it. In 2002, after graduating from Indiana University of Pennsylvania in a specialized program with a major in elementary education, a minor in Spanish, she relocated to Bellefonte with her college beau and first husband. She has done some teaching here: subbing in the State College Area School District, tutoring before and after school at the Spring Mills Elementary School, a summer’s teaching at the Centre Hall and Gregg Township elementary schools. Her two older sons were born during her first marriage. (“I want to keep my sons near their father.”) The third was with her husband since 2011, Robert Zeigler, the manager of Macy’s merchandise team here, whom she had met at a pre-band karaoke session. Through their middle names, in particular, the boys already speak volumes: 13-year-old Max – Maxwell Rashi (“which means a treasure in Arabic”), 11-year-old Wes – Wesley Damir (a Slavic term that means “one who brings peace”), and 5-year-old Theo – Theodore Rex (the title of a Theodore Roosevelt biography mom was reading). Joining his brothers in the Penns Valley Area School District, Theo will start kindergarten this fall at Penns Valley Elementary School. Viewing their mom’s stage life, “They try to play it cool, but they definitely think it’s cool,” Miss Melanie says. Many of her band gigs are in State College. The most distant was a Chautaqua, New York, music series in 2016. This month, they’ll continue their regular Friday night appearances at Otto’s Pub & Brewery and will perform on two Saturdays – for the State College Brew Expo on August 11 and for “Women’s Voices” at The State Theatre, for the benefit of the Centre County Women’s Resource Center, August 18. While this is the first band for Miss Melanie, it’s hardly that for other members. Leader and guitarist Mark Ross of Lemont, a 1983 Penn State graduate in human services, led the popular Queen Bee & the Blue Hornets from 1984 until it broke up in 1999. It was one of nearly a dozen bands that the 57-year-old Greene County native has strummed for. Ross makes audio books for young people through EIFRIG Publishing of Lemont. For 13 years ending in 2011, he was the children’s music specialist for the Children’s Development Lab on campus. “You can teach a lot of things with music, which is awesome,” says Ross, who, for the past 20 years has sold and repaired guitars at his vest-pocket store downtown. Using mail-order credentials, he also unites couples. The band’s upbeat organist, known as “Rev,” holds an inactive mail-order certificate. Recounts James Harton, 46, of State College about the title: “Back in the mid-’90s, a former band-mate left a message on my answering machine addressing me as Rev. It stuck.” He later made the nickname official. A pianist since age 7, the Air Force brat had his first paid performance in high school at Mount Holly, New Jersey, where his family settled. Performances continued at Pennsylvania’s Grove City College, where he majored in literature, minored in music. He now moves around himself as a taxi driver. Musician Christopher Coyne, the band’s drummer, has been a member only since 2016. For nearly 20 years, the State High and 1994 Penn State alumnus played in bands while teaching music and English in Pittsburgh and Flagstaff, Arizona. A composer for commercials, he has done educational videos, TV, and radio work. Coyne wasn’t around when the organizing band members agreed to adopt the name “Valley Rats,” after seeing it on a traveling Centre County baseball team T-shirt that Ross was wearing.